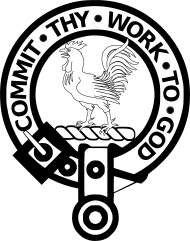 Clan Sinclair is a Highland Scottish clan who held lands in the north ofScotland, the Orkney Islands, and the Lothians. The chiefs of the clan were the Barons of Roslin and later the Earls of Orkney and Earls of Caithness. No certain record exists but it is likely that the Sinclairs came from St Clare inNormandy. They first went to England (before they came to Scotland) withWilliam the Conqueror during his invasion of England. The name was originally “Saint-Clair” which was a place name. Richard of Saint-Clair and Brittel of Saint-Clair are both mentioned in the Domesday Book. William of Saint-Clair accompanied Saint Margaret of Scotland, daughter of Edward the Exile to Scotland in 1068, where she eventually married Malcolm III of Scotland. In return for his efforts, the king supposedly granted Sinclair the barony of Roslin, Scotland “in free heritage”. One of the earliest recorded Sinclairs in Scotland was Henry of Saint-Clair/Sinclair, who obtained a charter for the lands of Herdmanston in Haddingtonshire in 1160. The chiefs of Clan Sinclair, the Earls of Caithness, descend from Sir William St Clare who was sheriff of Edinburgh and who was granted the barony of Roslin (Rosslyn) in 1280. During the Wars of Scottish Independence, Sir William Sinclair of Rosslyn was captured at the Battle of Dunbar (1296) and died later, probably in the Tower of London.Henry, his son, was also captured and later sent to St. Briavels Castle, and in 1296 he swore fealty to Edward I of England. In 1303 the Battle of Roslin took place where Scots under Henry Sinclair of Rosslyn and the Clan Comyn defeated an English force. The Battle of Loudon Hill took place in 1307 where Scots under Robert the Bruce, assisted by Henry Sinclair of Rosslyn again defeated the English. The family initially favoured John Balliol‘s claim to the throne but later it became paramount that they gave their loyalty to Robert the Bruce. The Battle of Bannockburn was fought in 1314, where the Clan Sinclair fought in support of Robert the Bruce. After the battle Robert the Bruce gave William Sinclair his sword. The Battle of Donibristle took place in 1317, William Sinclair, Bishop of Dunkeld, rallied the Scots army to defeat an English invading force in Fife. In 1379, Sir Henry Sinclair, who was also Admiral of Scotland claimed the Earldom of Orkney through his mother and received it from Haakon VI of Norway. However the earldom of Orkney was later resigned by order of James III of Scotland. Henry I Sinclair, Earl of Orkney, Baron of Roslin, and Lord of Shetland (c.1345-c.1400), was a Scottish explorer nobleman. In 1391 he conquered the Faroe Islands. He is also alleged to have voyaged as far as the Americas in 1398 (being hypothetically identified with Zichmni, who travelled with the Zeno brothers, for the first time byJohann Reinhold Forster in 1784 ); believers in this hypothesis claim he possibly landed in both Massachusetts and Nova Scotia. The voyage to America is largely disputed. According to a biography published many years after his death, he died in battle against the English around the year 1400. Henry II Sinclair, Earl of Orkney was taken prisoner by the English at Battle of Homildon Hill in 1402 but was soon released. In 1406 he escorted Prince James to France but the ship was captured by the English and both were imprisoned in the Tower of London. In 1407 he escaped or was released on payment of a ransom. William Sinclair, 1st Earl of Caithness (3rd Earl of Orkney and Baron of Roslin) was High Chancellor of Scotland between 1454 and 1458. He had been granted the earldom of Caithness in 1455. He split the family lands, disinheriting his eldest son, William (“the Waster”), who later became the second Lord Sinclair, instead giving the lands of Caithness to his third son, William Sinclair, 2nd Earl of Caithness, in 1476, and the lands at Roslin to his second son, Sir Oliver Sinclair. William Sinclair, 2nd Earl of Caithness was killed fighting for James IV of Scotland at the Battle of Flodden in 1513. There was a loss of 300 Sinclairs including George Sinclair of Keiss, Henry 3rd Lord Sinclair, Sir John Sinclair of Herdmanston, The Bishop of Caithness as well as James IV of Scotland. John Sinclair, 3rd Earl of Caithness (1490–1529) died at the Battle of Summerdale in May 1529, leading 500 men to help James Sinclair defend Orkney. He was succeeded by his son George Sinclair 4th Earl of Caithness. William, 4th Lord Sinclair was taken prisoner. At the Battle of Solway Moss, 1552, Scots, commanded by Oliver Sinclair of Pitcairns were beaten by the English. In 1568, Henry 3rd Lord Sinclair assisted Mary, Queen of Scots, to escape from Lochleven Castle. In 1570, John Sinclair, Master of Caithness, son of George Sinclair, 4th Earl of Caithness burned the local Cathedral in pursuit of the Morays who had taken refuge in the steeple. George Sinclair, 4th Earl of Caithness later imprisoned his son, the Master of Caithness, for making peace with the Morays. The Battle of Dail-Riabhach took place in 1576, involving the Clan Mackay and Clan Sinclair. The Battle of Allt Camhnatook place in 1586, involving the Clan Sinclair, Clan Mackay and Clan Gunn. In 1588 Castle Sinclair Girnigoe withstood a siege by the Earl of Sutherland and in 1590 George Sinclair, 5th Earl of Caithness invaded Sutherland which resulted in the Battle of Clynetradwell. In 1592, 3 April, George, 5th Earl of Caithness resigned Earldom in return for novodamus and remainder to his son William Sinclair. On 11 December William Sinclair of Mey was knighted by King James VI of Scotland. A Victorian era,romanticiseddepiction of a member of the clan by R. R. McIan, from The Clans of the Scottish Highlands, published in 1845. In 1601, 21 October, Henry 5th Lord Sinclair died and was succeeded by grandson Henry. In 1606, George 5th Earl of Caithness, was, by an Act of Parliament allowed to change the name of Girnigoe Castle to Sinclair Castle. See: Castle Sinclair Girnigoe. The Battle of Kringen took place in 1612, Otta, Norway, George Sinclair was killed with most of his men in an ambush. In 1650 Major Sinclair assisted James Graham, 1st Marquess of Montrose at the Battle of Carbisdale where they were defeated. They escaped to Ardvreck Castle, but there they were betrayed by MacLeod of Assynt and were executed. Sir William Sinclair of Rosslyn was killed at the Battle of Dunbar (1650) and was the last knight to be buried in full armour below Rosslyn Chapel. General Monck sacked Rosslyn Castle but the Chapel was spared. In 1651, at theBattle of Worcester, John 9th Lord Sinclair was captured by Cromwell’s forces and imprisoned in the Tower of London and then at Windsor Castle until 1660 when he was liberated by General Monck. In 1657, George Sinclair 6th Earl of Caithness was present when Oliver Cromwell was proclaimed Chief Magistrate of the three nations in Edinburgh. The Battle of Altimarlech took place in 1680 between Clan Campbell and Clan Sinclair. Legend has it that so many Sinclairs were killed that the Campbells were able to cross the river without getting their feet wet. Clearly, however, the Sinclairs had influence in high places as only a few years later, in 1681, they regained the earldom by an order of Parliament. In 1698, George Sinclair 7th Earl of Caithness died. He was succeeded by John Sinclair of Murchill (Murkle) 8th Earl, his cousin. During the Jacobite rising of 1715 the Clan Sinclair supported the Jacobite cause, however by the time of the Jacobite rising of 1745 the Clan Sinclair supported the British Hanoverian Government. In 1708, Chief John, Master of Sinclair (Son of Henry Lord Sinclair) after killing two men in duels was exiled to Prussia but later pardoned by Anne, Queen of Great Britain. In 1715, John Master of Sinclair captured a vessel with 420 stand of arms bound for the Earl of Sutherland. In 1715, at the Battle of Sheriffmuir, David Sinclair of Brabsterdorran fought for Jacobite cause, as did John, Master of Sinclair who fled toOrkney and then to Europe. In 1733, 3 November, John Sinclair of Murkle the younger son of John 8th Earl created Lord Murkle. In 1736, Sir James Sinclair glazed the windows for the first time of Rosslyn Chapel, relaid the floor with flagstones and repaired the roof of the chapel. In 1736, Sir James Sinclair of Rosslyn resigned his office as hereditary Grand Master Mason of Scotland to the Scottish Lodges on their foundation. He was later reappointed for his life. The Sinclairs of Roslin (Rosslyn) laid claim to be hereditary Grand Master Masons of Scotland. In 1739 forty-four Scottish Freemasons’ Lodges met in Edinburgh to found the Grand Lodge of Scotland. William St Clair was a candidate for Grand Master and promptly became the first elected Grand Master after offering to surrender his hereditary rights. On 17 June 1739 Major Malcolm Sinclair ‘A good and faithful servant of Sweden‘ was charged with affairs of State, he was assassinated at Grunberg in Silesia by agents of Tsaritsa Anna of Russia. In 1745, 4 June, Sir James Sinclair of Rosslyn, a Lieutenant general with the Royal Scots regiment was appointed the Commander of the British Forces in Flanders. In 1746, 16 April, at the Battle of Culloden Sir James Sinclair of Rosslyn commanded the Royal Scots regiment on the British Hanoverian government side. About 500 Caithness Sinclairs were ready to join the Jacobites, although the Earl of Caithness, their chief supported the British Government. In 1750, Sir William Sinclair of Dunbeath Founded Baptist Church at Keiss. Roslin Castle, in Midlothian, is considered to be the earliest seat of the Sinclairs in Scotland. It was probably begun by Henry I Sinclair, Earl of Orkney (c.1345-c.1400). 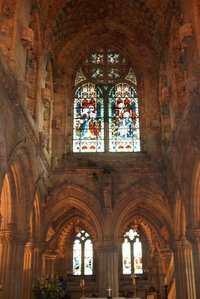 His family also built the famedRosslyn Chapel nearby. Castle Sinclair Girnigoe is perhaps the best-known Sinclair Castle. It was dramatically situated on the cliffs just outside Wick. Although now ruined, it is well worth a visit and it still contains both a secret chamber in the vaulting of the kitchen ceiling and a grim dungeon where, it is said, the 4th Earl of Caithness imprisoned his son and heir and fed him salt beef so that eventually he died mad with thirst. Castle of Mey is another former Sinclair property which although was originally known as the Castle of Mey, its name was changed for a time to Barrogill Castle. It was built by George Sinclair, 4th Earl of Caithness. In 1952 the castle was purchased byHM The Queen Mother who changed its name back to Castle of Mey. Ackergill Tower was seized by the Sinclairs in 1547 but later returned to the Clan Keith. It was acquired by the Sinclairs again in 1612. Braal Castle was granted in 1455 by James II to William Sinclair, Baron of Roslin. Dunbeath Castle was acquired by the Sinclairs in the 15th century. Keiss Castle seat of the Sinclairs of Keiss branch of the clan.